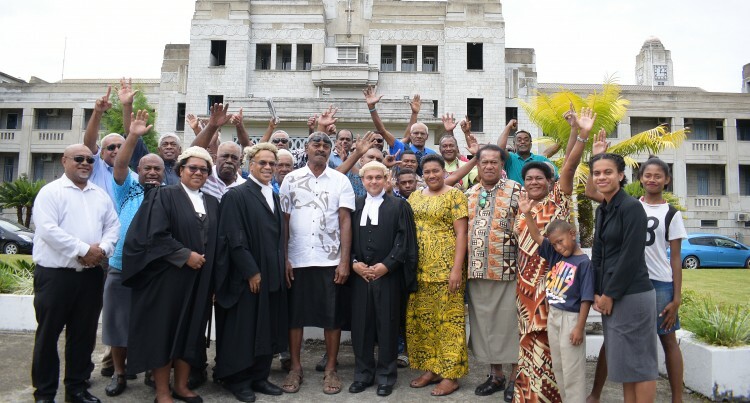 Landowners from Yavusa e tolu (Navatulevu, Sila, Noakuilau ) with lawyers Mirian Naco, Akuila Naco and Julian Moti outside Court in Suva on August 15, 2018. Photo: Ronald Kumar. The iTaukei Land Trust Board (TLTB) would like to clarify the outcome of the High Court proceedings entitled HBC 319 of 2016 that was recently called before the High Court in Suva on August 15, 2018. The proceedings were formally brought to an end on August 15, 2018 after the parties (Ratu Timoci Duaka Dawai and others as applicants and TLTB, Dubbo Limited, Barton Limited, Farleigh Limited as respondents) by consent agreed to the disclosure of a document which the applicants had initially sought by filing the proceedings. TLTB would further like to clarify that apart from the parties consent to disclose the document, there were no other orders made as to the subject matter of the proceedings or any related issue. As mentioned above with the agreement of the parties to disclose the document, the proceedings are now at an end. The Court did not make any findings regarding nor deliberate on the status of the Sheraton and Westin Leases or any related issues regarding those leases as perpetuated in the media and social media platforms. TLTB is steadfast in its position to safeguard the interest of the landowners and their future generations in the long term by negotiating better and equitable benefits with the current owners.